This article develops and applies a framework for analyzing the relationship among institutions, cost structures, and patterns of labor–management contestation over organizational boundaries. Collective negotiations related to the externalization of call center jobs are compared across 10 incumbent telecommunications firms located in Europe and the United States. All 10 firms moved call center work to dedicated subsidiaries, temporary agencies, and domestic and offshore subcontractors. A subset of the firms, however, later re-internalized call center jobs, in some cases following negotiated concessions on pay and working conditions for internal workers. Findings are based on 147 interviews with management and union representatives, archival data on restructuring measures and associated collective agreements, and wage data gathered through collective agreements and surveys. 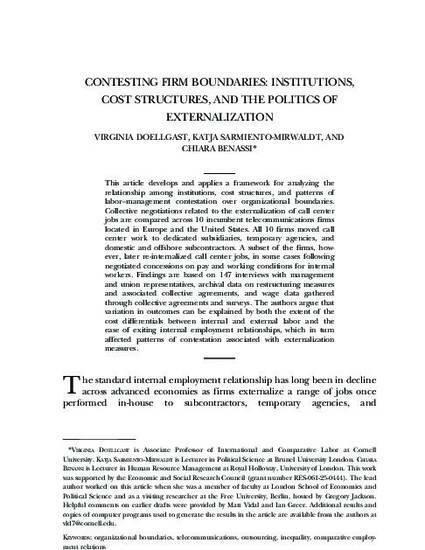 The authors argue that variation in outcomes can be explained by both the extent of the cost differentials between internal and external labor and the ease of exiting internal employment relationships, which in turn affected patterns of contestation associated with externalization measures.